If your blog is precious to you, you’ve probably already backed it up with one of the methods we show in our Blogger Tutorial Videos. Those techniques provide ways to restore your Blogger blog if something should go wrong, or to make web pages out of your Blogger monthly archives if you just don’t want to use Blogger anymore. But, what if you just don’t want to use computers anymore? You’d like future generations to be able to peruse your Blog just like they do your other photo albums and boxes of letters. If your Blog is solely a web thing, it will dissolve into the ether one of these days, certainly in a generation or two! It is so easy now to convert your blog into a book! When my Mom traveled with us in the RV for 6 weeks, I took just those 6 weeks and turned them into a beautiful hard-back book. I used Blog2Print.com and it was just a few clicks to specify what part of the blog to use and what format I wanted. 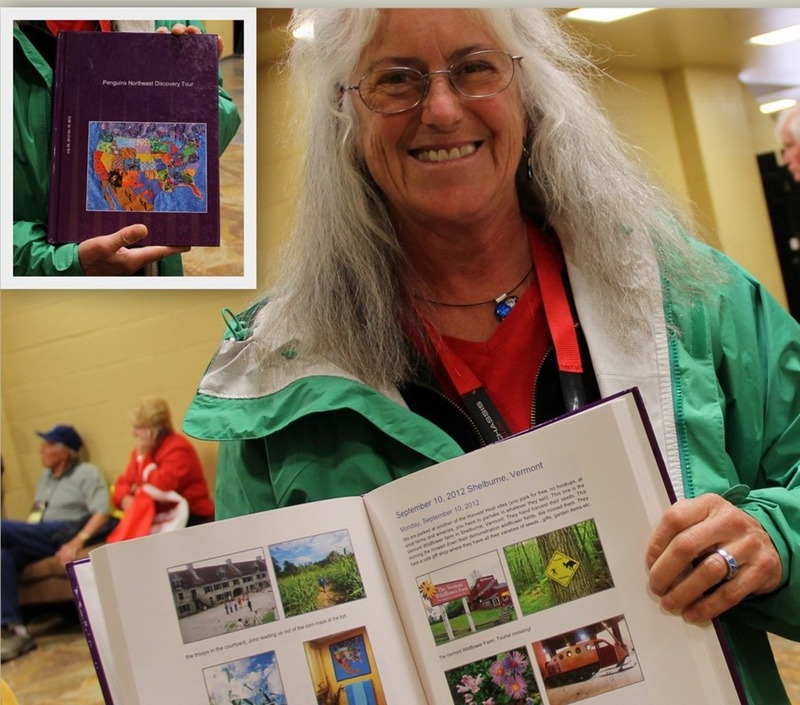 The woman in the photo likes to have her blog in book format just for herself – so much fun to flip thru the pages and revisit her travels. Those hard-back books can get expensive. 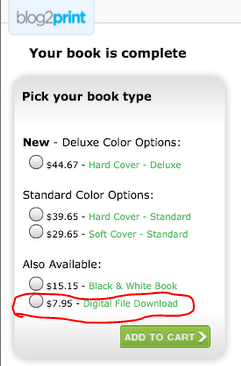 See the image below showing $44.67 for a hard cover book, and I only selected a couple of months! But notice the $7.95 Digital File format. And, that remains $7.95 no matter how many pages are involved. Then, you can print it yourself if you want. At least you have a complete copy of all your posts and pictures in a file on your computer! There are probably other services like blog2print, if you have any experience printing your blog, please leave a comment below. Published by MrsGeek, in Blog. Tagged with Blogger, print your Blog. I tried out Blog2print for my travel blog and found it very easy to use, with just a few limitations. At first i used the “compact” option, but found the embedded captions on the pictures were separated from the picture; so I opted for the “snapshot” option, and it took care of it. If you used the wrap text feature in the blog, there is often a strange break in the words when it shows up on the book pages, but i accepted this limitation, because the rest of the book looked so good. It does not handle the transfer of a chart, but I called the help line and talked to a REAL person who gave me a solution for it. (I replaced the chart in the blog post with an image of the chart). If you make certain changes (I.e. move from compact to snapshot, or change a chart in the blog post), you have to build a new book. But, because it is easy, it wasn’t a big problem. I ended up ordering both a book and a digital copy. I can’t wait to see my blog in print. Thanks Geeks for first getting me started on a blog, and then for providing the timely tip on saving the blog in a book!